Curtis Joseph, former NHL goalie and one of the Toronto Maple Leafs’ most famous players, will be at the Alder Recreation Centre on next Tuesday, Oct. 30, as part of his cross-Canada book tour to sign his newly published memoir. With the event being organized through BookLore, part of the proceeds from book sales will go to the Orangeville Wolves’ special needs hockey team. 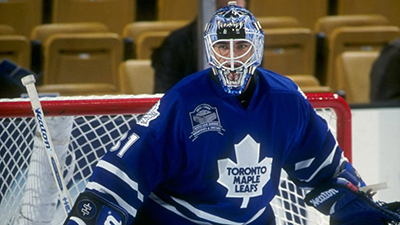 The book, “Cujo: The Untold Story of My Life On and Off the Ice,” written with Kirstie McLellan Day, details Joseph’s rough upbringing, being raised in East Gwillimbury, to stardom in the NHL. Born to unmarried teenage parents, he was given up for adoption shortly after birth. Growing up in a home for mentally ill patients run by his adoptive parents, his adoptive mother struggled with addiction, which led to his severe neglect. Joseph was not drafted into the NHL. He was signed as a free agent by the St. Louis Blues in 1989. For 19 seasons, the man affectionately known as Cujo played for the Blues, Edmonton Oilers, Toronto Maple Leafs, Detroit Red Wings, Phoenix Coyotes, and Calgary Flames. “If you don’t get drafted, you still have opportunities, you still have a chance. It’s not the end of the world, you just keep improving, you keep working on your craft, if you love to play, you make it work,” he said. Despite never winning the Stanley Cup, Cujo is considered by many one of the best goalies of all time. He is sixth overall in games played (943), fifth overall in wins (454), and sixth in saves (24,279). He was also the first goaltender to have 30 or more wins in a regular season for five different teams, was awarded the King Clancy Memorial Trophy, and won a gold medal with Team Canada at the 2002 Winter Olympics. During Joseph’s time, he faced off against some of hockey’s all-time greats, including Joe Sakic, Wayne Gretzky, Mark Messier, Mario Lemieux and Teemu Selanne. He explained that he developed a “different mindset” to every game, arena, and team to gain a victory. He re-joined the Leafs for his final season in 2008-09, and though he admitted it was tough being the backup goalie, he was still popular with the fans. Only the book with a booklore sticker on it will be signed at the event, which begins at 7:00 p.m.